Getparkplus has published a list of the top 100 parking influencers. The list was compiled by collecting sets of twitter accounts related to the keyword 'parking', and then finding out which accounts are followed by other accounts in the data set. The Prankster failed to make the cut. Other notable failures include, Parking Cowboys, the Notomob and Barry Beavis. The algorithm used only takes into account the closed twitter group mutual admiration society, and does not measure number of followers, number of parking related tweets, blog activity, blog hits, website hits, facebook score, books published or book ranking. Or, come to that, the number of petitions successfully submitted to parliament (requires at least 10,000 signatures). The Prankster did not make this list either. Hmm. Hmm. The Prankster will be back soon, once he has sufficiently tweaked the algorithm. Mr K appeared for himself. Miss Upoku from LPC Law represented ParkingEye. Mr K based his argument on signage. The entrance sign met the BPA standard for size, font etc. but was out of view from the driver’s seat when entering the car park because it is located 2 meters up and facing perpendicular from the direction you travel in to enter, instead of straight ahead. The first sign you come across is one that contains the contract (lots of small print) and if you park in the first available spaces the next sign was hidden by a tree branch. Mr K argued that the other 18 or 19 signs throughout the car park were inconsequential because he didn’t pass them before he parked up. He supplied a video for evidence. The Judge ruled that it wasn’t reasonable to expect the driver to know that there was a fee for overstaying based on this. He questioned Mr K who had visited the car park twice before due to the fact that you have to pass a number of signs before leaving the car park so he might have known it was a controlled park. Mr K argued that you wouldn’t be looking for signs when leaving and that driving through the car park can be avoided if the space in front is empty. If the space in front is empty you can pass through it and miss out the rest of the car park. The claim was dismissed and Mr K was awarded costs. Leave to appeal was refused as the decision was made on a finding of fact, not a point of law. 3) Permission to appeal refued because the court finds as a fact that the 1(b) sign was not visible from a car, the sign near where D parked was obscured by foilage and that whilst D could have seen the 1(a) sign near the entrance he had to absorb other information on entering the car park and that sign alone was not sufficiently prominent to establish that it was unreasonable that he missed it. Signs 1(a) and 1(b) were from ParkingEye's evidence pack. MIL Collections lost in court in Bristol County Court on 19th April. MIL decided not to turn up and informed the court and defendant they would be relying on the paperwork. They suggested the defendant might prefer not to turn up too, but the invitation was politely declined. The judge read through the case, which took about 15 minutes, and asked how the value of the alleged debt was arrived at. The defendant confirmed this appeared to be by adding random amounts to letters from Parking Debt Collectors, Dara Debt Recovery and MIL Collections, as no other explanation had ever been advanced. JAS didn't follow the POPLA process properly. The judge took the point about champerty and maintenance but decided that point failed. 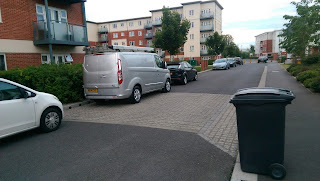 He decided that the claim failed because no evidence was provided that the parking terms had been contravened. The photographs simply showed a well-parked car. The judge stated that JAS Parking would therefore also have failed had they brought the claim. The Prankster is not aware of any contested hearing which MIL Collections have won. It appears then that MIL rely on bullying and intimidation to make their profits, rather than any substance to their cases. It also appears that MIL do not believe that the concept of debt applies to them - The Prankster has heard of several cases where costs were awarded against MIL, but which MIL have not paid. Have you won a case against MIL which MIL have not paid? If so, please contact the Prankster at prankster@parking-prankster.com. Link Parking win Pyrrhic victory in court. Will Hurley's two faced behaviour exposed. 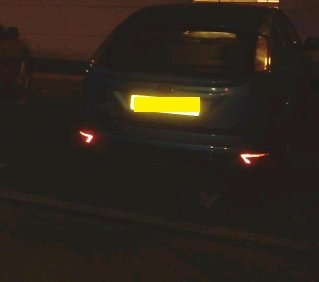 Link Parking won in court in Cardiff, charging a visitor to a housing estate for daring to have their wheel a few inches over the line. Their evidence pack showed the car parked in the next bay had no problems. Despite Gladstones attempts to foul-up the case by filing signage which belonged in another car park***, the judge decided to be lenient and allow Link to introduce new evidence after the filing deadline. The victory showed how out of touch with the needs of their customers Link Parking are. The landowner had repeatedly asked Link to cancel the charge as the motorist was a genuine visitor. When Link refused, their contract was cancelled by the landowner. The court hearing was therefore something of a last hurrah for Link Parking. Link Parking will have been well out of pocket with the case, paying Gladstones to file the case and prepare a witness statement, plus a solicitor from LPC law to conduct the hearing for them. And of course they will no longer be plying their unwanted trade in the housing estate, having been given the boot for overly aggressive parking enforcement. This is an excellent example of how two-faced Will Hurley of Gladstones Solicitors and the IPC is. Will has spouted off countless times on behalf of the IPC, including on national TV, about how his organisation is all about landowners rights, and how landowners should be able to control parking how they like on their own land. 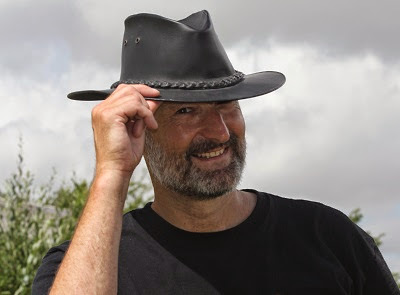 However, when Will is wearing his Gladstones hat he is perfectly happy to ride roughshod over landowner wishes, ignore their requests to cancel charges and kowtow to the parking operators. This is of course a poor long-term strategy, and one guaranteed to lose contracts long term - no sensible customer will renew contracts from a service company ignoring their wishes. The Prankster believes that proper parking management companies do not act in this way and that there is a better way. Bargepole was in court today at High Wycombe, representing three defendants who had received multiple ticket claims at the estate where they all live. The flats each have one allocated parking space, with permits issued, and the private road has signage stating ‘No Parking At Any Time’. Most of the flats are occupied by couples with two cars, and there was photographic evidence submitted to prove that on any given day, vehicles are parked all along the road. a) The claimant’s notices attempt to make a forbidding offer, which isn’t an offer at all, therefore no contract exists. 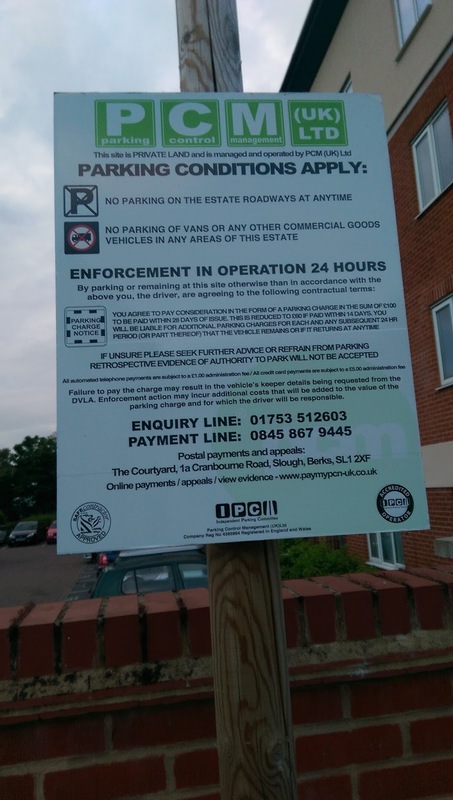 Bargepole attached one of CPS’s signs as an example of how a contractual offer could be made by a parking operator, and a copy of the opinion on this from Professor Furmston, author of the contracts textbook. c) There can be no legitimate interest in issuing charges to residents, who were told at a meeting when this scheme came in that it was aimed at external ‘abusers’. The Beavis test is therefore not satisfied. The Claimant was represented by Thomas Samuels LLB, MA (Oxon), a barrister from Gough Square Chambers (the same chambers as Jonathan Kirk who represented ParkingEye against Mr Beavis). He handed Bargepole a skeleton in the waiting room, which didn’t raise any new arguments, and was simply a summary of the Claimant’s case. Also present was Georgina Philpot, the PCM employee who had signed their witness statements. District Judge Glen opted to hear all three cases in a single hearing, as requested by us, and agreed by the other side. Was there a contract at all? If so, was the doctrine of penalties engaged, and did Beavis apply? Could the Claimant recover the additional £50 per ticket, stated on the signage as ‘enforcement action may incur additional costs’. 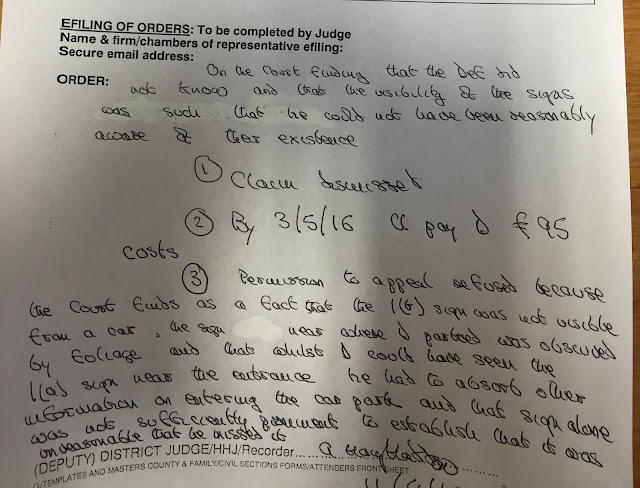 Mr Samuels presented his case, which was that this was a contractual charge, and that the wording stating ‘if you park otherwise than in accordance with the conditions you agree to pay consideration in the sum of £100 …’. This was, he asserted, a conditional offer. In the alternative, the £100 could also be considered as damages for breach of contract, in which case the Beavis judgment would apply, because PCM have a legitimate interest in enforcement in accordance with the wishes of the landowner. He also submitted that the additional £50 per ticket was covered by the Claimant’s evidence of incurring additional costs of enforcement. DJ Glen did not allow any cross-examinations, so Bargepole abandoned the planned questions for Ms Philpot, and then presented the defence case. His arguments were that as the sign stated no parking at any time, there was no offer of parking, and therefore there could be no contract. To support this, Bargepole cited Arrale v Costain, and evidenced an example of a sign from Combined Parking Solutions showing how an offer could be made. He also included the email from Prof. Furmston, confirming the analysis. He then said that if it was held there was a contract, PCM would have no legitimate interest in enforcing charges against residents, as this had never been the purpose of the scheme. Finally he said that whatever the outcome, the £50 was not communicated in clear terms, and would not be recoverable. The Judge sent everyone out for 20 minutes, then back in for Judgment. He started by referring to the Beavis transcript, at paras. 94, and 189/190, which made it clear that it was agreed by all parties that there was a contract between PE and Beavis. He said that analysis didn’t apply in this case, as the notice was absolutely prohibitive, and didn’t communicate any offer of parking. The landowners may have a claim in trespass, but that wasn’t under consideration here. He also dismissed Mr Samuels’ suggestion that if the court had copies of the leases, these might oblige the defendants to observe all parking restrictions, as these were not in evidence. He stated he was dismissing all three claims, and then went on to make observations on other points. He said that the photographs evidenced by the defendants clearly showed that it was a wide roadway, and that parking vehicles on one side would not cause any obstruction. However, if there had been a valid contract in place, he probably wouldn’t have considered the £100 to be a penalty. He also would not have allowed the extra £50 to be claimed, under the contra proferentem rule. No permission to appeal was sought by the Claimant. The Defendants were awarded their costs for lost earnings, at £95 each for Mr Bl and Mr W, and £80 for Ms L.
This decision essentially blows the IPC signage model out of the water, meaning that pretty much all of their car parks will need re-signing. It also confirms the Prankster's opinion that the IAS is essentially a kangaroo court. The IAS have been informed many times that IPC signage does not create a contract as the notice is forbidding, but the IAS baristas have proved unable to understand this basic point of contract law. IPC signage is apparently verified and approved by either Gladstones Solicitors or the IPC. Professor Furmston is of course the co-author of Law on Contract and his opinion can therefore be though of as compelling, and of far more weight than anyone from Gladstones Solicitors. It may be that the IPC companies will therefore have a case against whoever validated their signage in the first place, and can recover the costs of reworking their signage. Any motorist who has paid a charge in these circumstances may well have a case to sue the parking company to recover the payment. This will of course depend on the exact signage, and the circumstances of parking. The Prankster hopes the judgment provides much needed clarity for motorists who receive private parking charges. Unfortunately, there have been a number of militant solicitor firms who have caused operators additional costs and worry prior to the judgment in declaring the charges as lawful and enforceable. Hopefully, those firms will now focus their efforts on properly advising operators on how to run a car park to provide genuine management as opposed to pillaging their customers rather than issuing blanket, erroneous, advice that all parking charges are enforceable. Finally, we should all remember that PCM-UK are the company caught out by BBC Watchdog for making things up during appeals. Wright Hassall decisions have started to come in. The first problem is that WH appear to have jumped the gun - motorists still have one day to add to their appeal evidence. The second problem is that some motorists have not received the initial WH letters, so the decision has come out of the blue. The third problem is that the WH assessor is not named...most likely for reasons which will become obvious. The fourth problem is that the assessment does not take the appeal points into account. The fifth problem is that the judgments are exceedingly short and do not even properly consider the appeal points they do cover. Obviously the BPA have not paid Wright Hassall enough for them to spend more than 5 minutes writing up their appeal judgment. The POPLA appeals process is now descending into farce. You get what you pay for, and on the above evidence the BPA have paid for a substandard, incompetent service, which is biased towards the operators and therefore demonstrably unfair. ISPA are currently monitoring the appeals process and have appointed two people to check appeals, so if you have any problems either with the procedures or with the quality and competence of the Wright Hassall assessors you should contact ISPA with your complaint. For several years now many parking operators have lied to POPLA to pretend their charge was a genuine pre-estimate of loss. The lie is of course laughable; parking companies make huge profits from their charges, as ParkingEye's accounts show - and of course Capita would not have purchased them for £57.5 million if this were not the case. Ironically at first ParkingEye used to admit they made no loss from overstays. 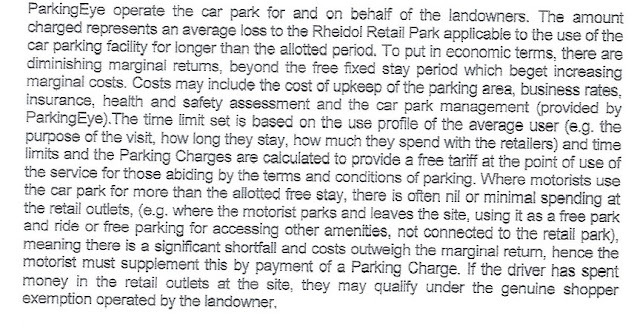 Here is an early GPEOL explanation they sent to POPLA for Rheidol Retail Park. Later on, as this lost at POPLA, they invented the fiction that it cost then £55 per ticket issued - a fiction doubly invalid, because even if these costs were allowed they would be impossible based on their own filed accounts. Now of course, as the Beavis case has changed the way penalties are interpreted, this fiction can be conveniently discarded. But having been lied to consistently for over 3 years, why on earth would POPLA believe anything a parking company states? Parking companies have been caught lying time and again regarding their contracts with operaters - not only with POPLA, but also in court. ParkingEye, for instance, redacted the contract in the ParkingEye v Beavis case to hide the fact they were apparently acting as agent of the landowner. This would of course have made the charge invalid, as the landowner instructed ParkingEye to cancel the charge, but they refused. In this latest case, reported on pepipoo, the operator did produce a contact...which blew their case out of the water. The operator was Horizon and the landowner, Sainsbury clearly did not want over-aggressive parking enforcement, because the contract contained a clause limiting charges for overstays. "Overstaying the parking time limit for repeat offences, from the second occurrence onwards, when parking within a time allowed restricted car park"
The charge was therefore clearly invalid, and Horizon should never have issued it. However, this begs the question; how many other charges issued over the years are actually invalid, and should not have been issued? The clear inference is that the boiler-plate landowner witness statements have no legitimacy, and that if operators wish to prove their right to operate a copy of the landowner contract is essential proof. This can of course be redacted with regard to the actual costs, but not the relevant terms and conditions. According to this comment on a previous Prankster blog, ALDI appear to have no confidence in the POPLA process. I telephoned the Retailer (Aldi) where I got my PCN in Feb 2015 that was in the GPEOL cases and told them about my letter from Wright Hassall and that I believed it was a 'conflict of interest'. I shopped at the store, had a receipt and overstayed unknowingly. Aldi didn't seem comfortable or aware Wright Hassall had in effect replaced POPLA. Aldi asked me to cancel my appeal and they would cancel the PCN subject to the appeal not having taken place. I had a phone call from Aldi yesterday confirming they had told Parking Eye to cancel my PCN. RESULT! 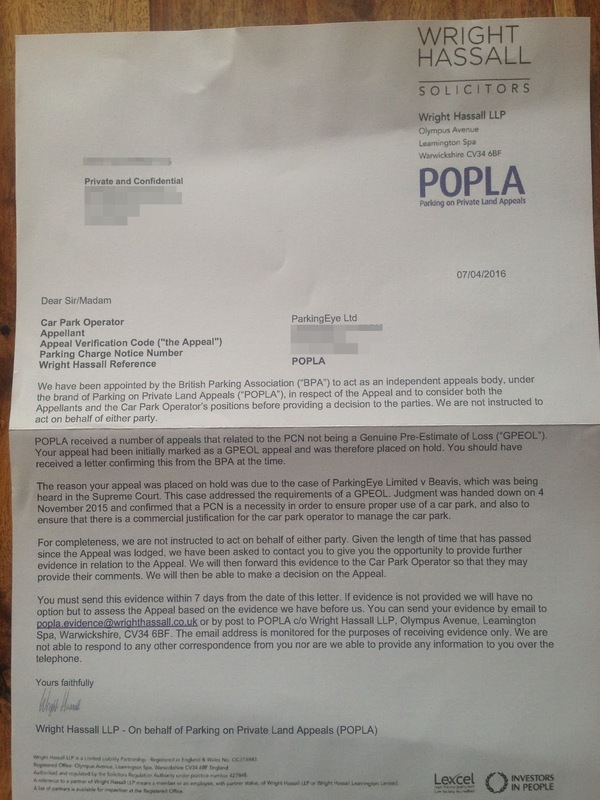 The Prankster therefore recommends to motorists who have a parking appeal due to be held by Wright Hassall that they contact the landowner and inform them that the POPLA process is in their opinion no longer independent but is being conducted by debt collectors who work on behalf of parking companies. 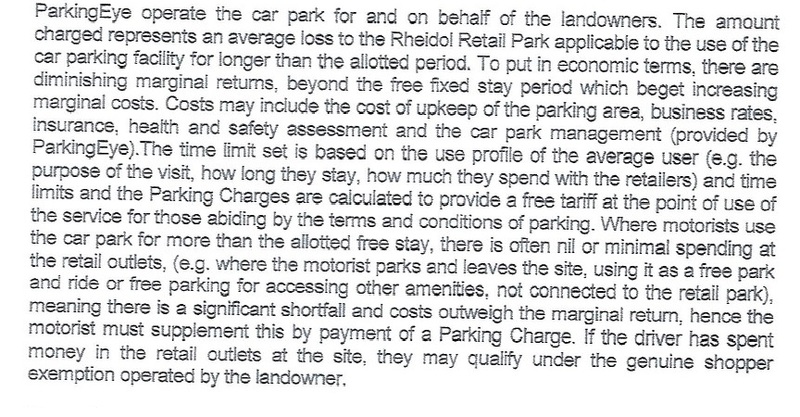 They can also point out that Wright Hassall do not appear to understand the law regarding parking charges, as evidenced by their court defeats on this matter, such as in this case recently held in Cardiff. On the 30th March 2016 the Independent Parking Committee filed papers with companies house to change their name to United Trade and Industry Limited. This leaves them stuck with a large number of signs plastered with the initials IPC, so they have come up with a new strapline, The International Parking Community. The International Parking Community is apparently a trading style of United Trade and Industry Ltd. 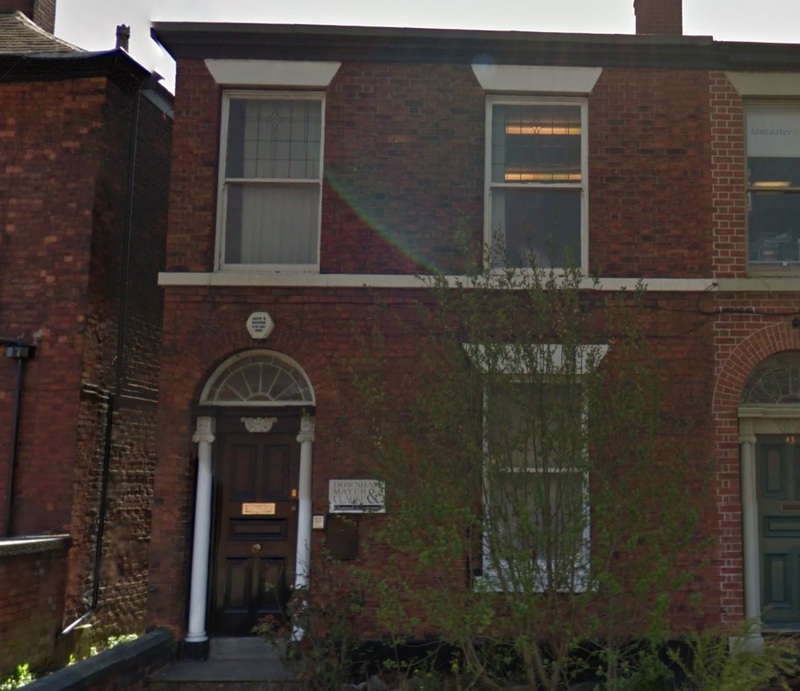 The company also changed their registered address in December 2015 to 41 Greek Street Stockport, SK3 8AX. This appears to be an accommodation address hosting a number of companies. 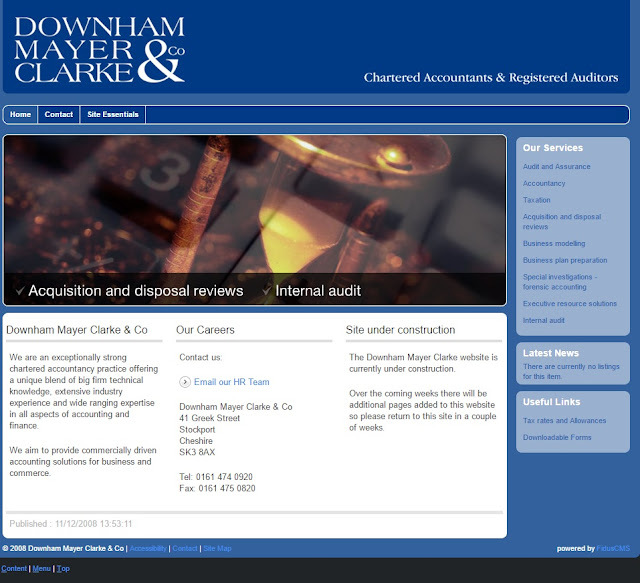 The large plaque on the side of the door is for Downham, Mayer, Clarke & Co, a firm of chartered accountants whose web site has been under construction since 2008. The contact address for the IPC is now a PO Box in Knutsford. If this is an attempt to hide the fact that the Red Cow Gang are associated, it fails on all accounts. It is well known that Will Hurley and John Davies are directors of both Gladstones and the IPC, and that Gladstones try and capitalise on disputed parking charges by encouraging parking operators to use their services to take claims to court, regardless of the merit of the claim. The Prankster does welcome the dropping of the word 'Independent' from the name. The IPC were never independent in the sense that they were equally fair to both motorist and operator, as can be shown by the almost indecently hasty erosion of standards as soon as they passed their probationary period with the DVLA. Almost overnight the appeals service became the now infamous 'kangaroo court', where motorist evidence is almost uniformly discounted and operator evidence almost uniformly believed. Their 'baristas' can be shown to be either biased or incompetent, as this recent gem from an appeal decision shows. The presumption that the Registered Keeper is the driver, is a presumption based in case law, namely Elliot -v- Loake (1982) which held that in the absence of sufficient evidence to the contrary, the keeper of a vehicle is assumed to be the driver. In my view there was ample evidence which justified the magistrates in this case arriving at the conclusion that this man was driving his blue sports car on the night when it collided with the stationary BMW. Accordingly, in my view, he was properly convicted on all three offences. In other words, the driver was convicted because there was ample evidence he was the driver, not because of the absence of evidence to the contrary. The Elliot v Loake decision is clearly a finding of fact, and not a presumption in case law. This is also clearly the view of the judiciaary, which can be seen from the number of cases when operators have tried to quote Elliot v Loake in hearings, and been laughed out of court. In addition, the Elliot v Loake case is concerned with the owner of the vehicle, and not the registered keeper, a fact which the IAS baristas conveniently misquote every time. The Prankster therefore looks forward to the IPC announcing they will also be dropping the word 'Independent' from their appeals service. The Prankster is not entirely sure if 'International' is appropriate either. David Carrod has researched the matter** and of the other EU countries, only the UK sells keeper data to parking companies. Private Parking companies just don't exist in mainland Europe.The only other EU member state where they do is the Republic of Ireland, but the Irish Government do not release keeper data to private companies. The IPC model therefore does not look like it is appropriate outside the UK. ParkingEye's claim for an overstay was thrown out of court in York by DJ Wildsmith. The claim revolved around a parking incident where a mother was travelling with a young baby. On arrival the baby was sick, and the mother had to visit the bathroom to clean up the baby. Following that, a ticket was purchased which, as shown in court, had an expiry time of 16:35. ParkingEye sent a parking charge for overstaying by 14 minutes, departing at 16:00. The terms and conditions of the car park allowed a top-up purchase at any time. The victim appealed, but ParkingEye lost the paperwork, claiming the appeal was never received, and refusing to allow an appeal later. In their defence, the victim argued that as ParkingEye's ANPR system knew the time of entry to the car park, that it was reasonable to expect the ticket machine to take this into account, and for the time on it to print the correct time. they also pointed out that the British Parking Association allowed a grace period on entering or leaving the car park. ParkingEye's advocate spoke to the victim before the hearing started and explained their case was that the victim should have appealed and that the Supreme Court case of ParkingEye v Beavis would be relevant. The judge disagreed and ended up giving the advocate a telling off for the case even coming to court. The judge ignored her pleas about the Supreme Court and then slammed her for Parkingeye's deficient appeal process. She then tried arguing about the time paid for the ticket, and that the victim should have known to pay for more before she left. The judge quizzed her on the grace period and the judge surmised that at worst the victim overstayed 14 minutes, at best 4 minutes and given the circumstances to bring her to court for 4 minutes lacked humanity. The hearing came to an abrupt end. The judge had already mentioned the humanity of the situation earlier and stated it was on this ground that ParkingEye should have dealt with it at appeal as, at best the dispute was over 4 minutes. The appeals procedure should have been more accessible and ParkingEye should not have brought it to court. The claim was dismissed but without costs. ParkingEye's deficient ANPR technology was found wanting yet again in court. In this latest case an unfortunate motorist found they had a CCJ registered against them when they attempted to make a purchase of a new car. On investigating, this turned out to be from a claim which ParkingEye had taken out against them. The lady had never received any court papers so applied for a set-aside, asking the British Motorist Protection Association for advice. The parking event, which happened back in 2013, was in the same car park where Barry Beavis was charged in the ParkingEye v Beavis case. However, in this particular case the motorist visited the car park twice. In the first visit, she found she had forgotten her purse. She then returned home to get it, and visited one shop where she spent £61. She retained the receipt, which she was able to show the judge. ParkingEye's ANPR system, which has been proved not fit for purpose in many court claims previous to this, was one again found wanting, recording just one long stay instead of the two visits. With the help of the BMPA the motorist filed a witness statement containing the following information. The alleged contravention never occurred. I visited the shops twice on that day. On the first visit I forgot my purse and had to return. I then only visited one shop where I still have my receipt for £61, which I will bring as evidence. ParkingEye's ANPR cameras incorrectly recorded my two short visits as one long stay. ANPR cameras are not 100% accurate and a large number of cases similar to this are documented on the internet. I have contacted the British Motorists Protection Association who inform me that one way ANPR cameras fail is when vehicles drive close to each other and block off the numberplate from the camera. Other errors are introduced if there is glare from sun or snow, if the camera angle is wrong, if the camera is misaligned with the road or if the road is too wide for the camera capabilities. Depending on the site, the camera accuracy will vary from as low as 70% to the high 90's. Normally this works to the benefit of the motorist, as the stay will not be recorded. However, in the case of double visits, this works against the motorist. This means that on the day of the incident I was one of the unfortunate victims of poor technology, with the cameras missing my first exit and second entrance. ParkingEye measure the accuracy of every site by recording the number of cars entering, but apparently never exiting, and also exiting, but apparently never entering. To protect against issuing charges for double visits they cancel all charges when accuracy falls below 70%. This is far too low a percentage, and accounts for the large number of complaints against ParkingEye by motorists who have made double visits. In the set-aside hearing, ParkingEye decided not to appear to contest the claim, but to send in papers only. After considering the papers and speaking to the motorist, the judge not only decided to grant the set-aside, but also decided that ParkingEye had no prospect of success in any future hearing. He therefore used his case management powers to dismiss the claim. It is fairly unusual to dismiss a claim during the set aside process. However judges do have wide reaching case management powers, and if the judge found that there was two visits then no contravention occurred and the sensible thing to do was to dismiss the claim. This saves time and money for both parties, as well as the court. Fresh from their spanking in court on Friday, where their client NGPM was found to have no authority to issue tickets, Wright Hassall have now started to process the stayed POPLA cases. Today, letters arrived in respect of some if not all of the stayed cases. The sentence of course not only does not make sense, but is a false interpretation of the Supreme Court judgment. The Supreme Court themselves were at pains to tweet that the judgment was only applicable to the 'use of this particular car park & clear wording of the notices'. There is a 7 day deadline to reply, starting from 7th April and expiring on Thursday 14th April. If you have not received your letter today The Prankster recommends you assume it has got lost in the post, and email your case to Wright Hassall anyway. It may well be that Wright Hassall are trying to pull a fast one, and get cases pushed through during the Easter holiday season when people are away and will not have a chance to reply. The Prankster cannot understand why after waiting more than a year, motorists suddenly have a 3 day deadline to reply to a letter. 2) If you have not received an evidence pack from the operator point this out to Wright Hassall. I have not received an evidence pack from the operator. I therefore assume the operator has decided not to contest the case. As the operator has not provided any evidence that the alleged event occurred, or explained how a contact was formed, or if the charge is contractual, for breach of contract or trespass, or that the signage was adequate to form a contract by performance, or that in line with the Beavis judgment, the wording was clear and the charge brought prominently to the motorists notice, I submit there is no case to answer to. This would be in line with previous POPLA decisions where the operator submitted no evidence. 'The Assessor’s reasons are as set out. 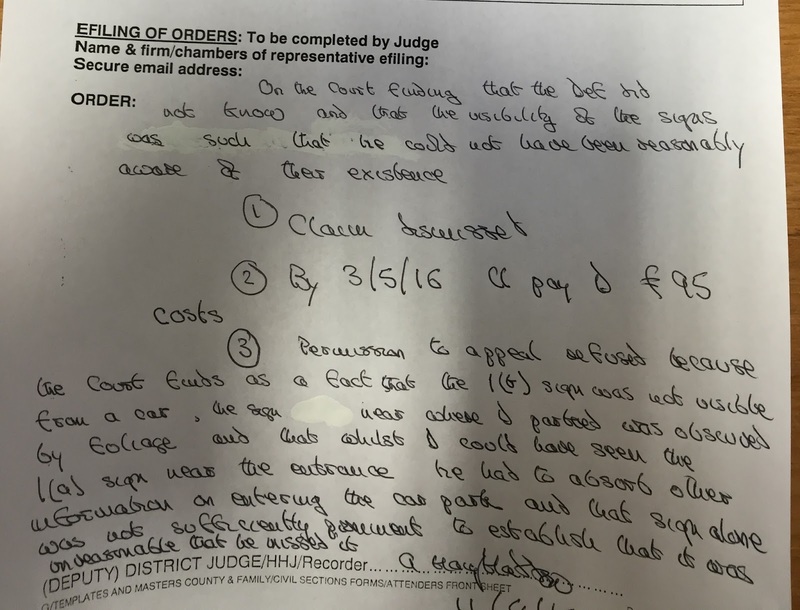 It is the Appellant’s case that the parking charge notice was issued incorrectly. 3) If you have received an evidence pack, but it just treats Beavis as a silver bullet without attempting to justify the charge, then you should point this out to Wright Hassall if the case is not to do with an overstay at a free car park. The Operator has not attempted to relate their case to that of ParkingEye v Beavis, and to therefore justify their charge. It is their responsibility to make there case. As they have not, there is therefore nothing for me to rebut. I content it is not the assessors job to make the case on behalf of the operator. The Supreme Court made it perfectly clear that the judgment was not a silver bullet which justifies all parking charges. On Nov 4th they tweeted that the judgment was taking in account use of this particular car park & clear wording of the notices'. 4) If you disagree that signage was sufficient, point this out. It is clear that signage plays a big part in the Beavisand that the basis the contract is not unfair is due to the 'clear and plentiful' signage. Para 287: In so far as the criterion of unconscionableness allows the court to address considerations other than the size of the penalty in relation to the protected interest, the fact that motorists entering the car park were given ample warning of both the time limit of their licence and the amount of the charge also supports the view that the parking charge was not unconscionable. The signage in this location is clearly deficient compared to the signage in the Beavis case. This brings both the penalty issue back in play, and also the unfair contract terms argument. I therefore content that when the signage is taken into consideration, the charge is both a penalty and an unfair contract term. 5) If you have receoved an evidence pack, then you should email in a rebuttal.